The following is the second message that we received in Egypt this past March 2012 over Equinox. You can find our other messages on our website at www.alunajoy.com under the "Articles for Personal and Planetary Transformation" link. It might be a good idea to read them in order as each message builds upon the previous one. We are sharing this message here with you just as we received it, in present time, with very little editing. We do this for a very important reason. We know that the messages that we receive are not just for our groups, but are for others as well. The Atlantean/Egyptian Masters and the Star Elders assure me that the message and the corresponding energy will be transmitted to you. So as you read this, you might want to imagine that you are with us. Also, always view the photos on the website that we share, as photos also hold some energy of the sites. Our hearts are the center point on this pilgrimage in life. The site of Luxor represents our heart's center point for this entire pilgrimage . . . this is what the ancient ones are saying. It is important that we have our center points, our hearts, opened and anchored. They are asking us to do this, because WE are going to build an entire new body, just as the Earth is going to build a new grid. This is the heart of this temple. This is where they started building this temple. They always build from the center out . . . the center being the heart. So we need, at this point in time, to start in rebuilding in our center, our new hearts, our holy of holies. The ancient ones discovered this heart center on the Earth's grid by an ancient form of alchemy and began building. When we were at King Tut's exhibit, remember that he had a sarcophagus in a wood box, which was in another wood box, which was in yet another wood box. It is like stacking Russian dolls. By doing this, they were building energy from the inside out. We have been building a new heart for the last few months, and the Ancient Ones say that now we are we are going to begin to build a whole new body. It will build this new body within a new spherical geometry that will also be multi-poled and multi-dimensional. This will allow us to live in this new world, and help us live in the present moment in unity consciousness. We began this pilgrimage at the heart of Luxor, because this entire temple represents the chakras of the human body. So, at this moment, our DNA, containing our cellular memory, is collecting information and using this ancient alchemy to build this new body. There is a heart, holy of holies, in every temple, and we will start in every heart center in every temple that we will go to. As we do this, we are going to build a whole new body build on descending frequencies. We have started at the crown chakra in Giza, and we will re-build ourselves from the stars down to the earth . . . from the crown chakra down to our root chakra. Ascended Master *Serapis Bey is one of the masters that anchored Luxor's energy before Atlantis fell. Serapis Bey and the Ascended Masters will give us a new orientation point and a new heart; this will be our starting point to build a whole new body. 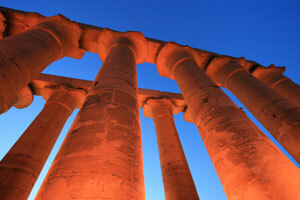 Luxor was built with the geometry of the old, ancient, Atlantean temples. The only other one that was built this way is Hatchetsup. At the time of the fall of Atlantis, Serapis Bey moved the Ascension Flame to Luxor, Egypt. They worked to recreate the pure energy of pre-Atlantis. They were hoping that they could capture some of this pure energy, but they failed to do this 100%. It is our job now to bring the rest of the light back into us. The fall of Atlantis was also a shift of an age. The world was going to ascend up to another frequency. It failed back then, but we will not fail now. Underneath this temple, there is still a powerful etheric record of this energy and the original ascension flame. It is still holding that holy of holies, that heart of hearts, for us now. It is perfect that we are starting our pilgrimage in the holy of holies in a temple that represents the human charka system and is the heart of the chakra system that lines up and down the Nile. This new body we are building will be our new vehicle for a next world, frequency, etc…. So check into your heart now . . . . Has everyone felt like they have given their heart to the process? Group member Alice: A guardian is checking us out. He noticed that it is US here now. So he is thanking you, Aluna. But also saying… "Go on, go on. Get on with it! What are you waiting for?" Now he is actually standing up, and as he pushed his chair back, I could hear the chair legs scrape on the floor. I ask "Are you leaving?" But he isn't. I feel this is him recognizing us now. He likes you (Aluna) and is agreeing with everything you are saying. Aluna continues . . . When the etheric guardians like you, they automatically invite you into a deeper place in the site's energy, and they create space for us. Notice that the physical guards and the guys with the guns either disappear or allow us to do this work in a protective way. We get our space. This happens a lot, yet it never ceases to surprise me. Okay, I am reminded of something . . . yesterday, in the Cairo museum, Sehkmet, the Goddess of magic and healing, said "When are you coming back? Come back." I think some of what she meant was for us to come back to who we really are; not to whom we have been, but to whom we really are. Now here in Luxor, the Masters are saying that we are building a new body, and they are giving us a new heart. They have been shifting the orientation of our hearts for months and months now, but they never said that they were giving us a new body until just now. So I don't know what the side effects will be with this . . . but I am sure that time will tell. So we want to thank the guardians for acknowledging that our hearts are pure and filled with the best intentions. When we walk into a site, it is important to introduce yourself to the guardians . . . who you are, why you are here, etc…. Tell them your name and inform them that you are here out of the goodness of the light and your heart. Let them know that you are a servant of light and came here to help humanity, and what you learn here you will take out into the world to share. When you do this, the guardians realize that you are not just trying to TAKE energy from this place but that you want to expand it. A lot of people come to these places, and they steal energy, because they are still in their ego. They think they can do something to the temple to make it better than it is, or that they want to activate it, because they think it is inactive. This is an insult to the guardians of the sites. These places don't need activating. The stones might be in ruins, but the temples have never stopped emitting amazing energy. So when we come in to a sacred site, and we recognize that it is still whole and pure and that it is still functioning, the guardians recognize this and open doors for us to work with the energy. They do this because we are humble, and they see that we are working with an open heart. It is a test that we must pass in each site that we enter into. When they see that we are coming from the heart, they will download what we need. So here is what they want us to do. Are you ready? As we walk out of this temple, we will be walking through the chakras of our new body. 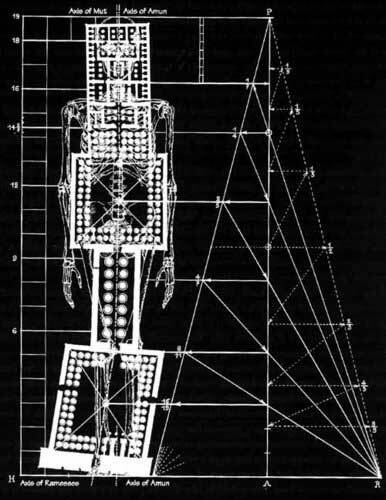 We are building a new architecture in our body (so using the image here . . . imagine yourself walking out of this temple, through and into our new chakras and thus building your new body.) Now there is something about a grid-like pyramid over the top of us as well. This is going to maintain impeccable energy so you can create the perfect body in the energy field that is conducive to this. The physical sun is also working like crazy, and this will activate us as well. People will get chest tightness during solar flares; but solar flares actually clean us out and raise up our frequency. It brings everything to the surface that is not of the light. This is why we have nightmares or have old issues that come up, because we need to finish cleaning the body's old memory. They tell me that everybody here (and those that will read this) are in good shape and are ready for this. We are ready for what is next, and we came here for what is next; otherwise we wouldn't have showed up in Egypt in a time that it scares most tourists off. Temples are built with chambers within chambers and sometimes will have small chambers all around the holy of holies. These are like energy cells that hold energy for the center point. At Dendara and Philae, there are little chambers all the way around their holy of holies that are like energy cells that hold energy in the temple. Luxor and Hatchetsup do not have this as they were built to hold pure Atlanten energy. Here in Luxor there is a holy of holies, and there is an outer center, and another outer center. It is like walking through a body of light. It is always interesting to pay attention to the geometry and the architecture that is in sacred sites. It is appropriate to start in the center and work our way out of a site, because that is how they built them. It is a rebirth for us. If you work the site the other way and start from the outside door and work your way in, you are actually doing it backwards and may be even de-volving yourself. But if you come directly into the center point, the heart of the temple, and work your way out, it actually is the proper way. We need to do this with our bodies as well. With every intent, begin with the heart first, then add in the intellect and the physical mean to make it happen. Let everything be birthed from your heart fist. Group member NancyAnn: And in the womb, the heart chakra is active in the beginning before there is the organ of the heart, and even the heart cells exist before there is a heart even pulsing together. So the heart is literally beginning even before the development of the embryo. Aluna continues . . . So you notice that when we open our hearts, and get in this space, that we get space and it quieted down. Guards said "Thank you". This can work for you as well when you are out in your 3D world. Just keep your hearts open and all doors will be open to you. Simple! There are a couple of Atlantean beings hanging out in Luxor. Above is Thoth the Atlantean but disguised in a stone that looks like Ramses. He has told me a lot over the years, and I will share a bit of it here . . .
Thoth tells us that . . . All energy here in the chakra system has a failsafe protection so no one could get to use until they could match the frequency. When Atlantis began to fall, the "powers that be", learned how to get around this. There was a flaw in the system, so they could use the power and hold it to control the people instead of using it to free the people. This energy that we have been given here today is to free us, and not to control us. Atlantis fell, because this powerful energy was used with a mis-use of power and ego. The ascension of the age failed and, everyone that survived the fall of Atlantis moved into another cycle without the evolutionary jump that one experiences at a shift on an age. But we learned many good things and will not fail again. After Atlantis fell, Serapis Bey, Thoth and others tried immediately to rebuild the temple here at Luxor, and the one at Hatchetsup, so that they would emulate what they had captured in Atlantis. They tried to recapture the energy and recreate temples, because they didn't want to lose the pure energy. It didn't work 100%, because they had moved into another age and things were working differently. Our geologists already know that magnetics drop, frequencies raise, magnetic poles shift and things change during the shift of an age. We are at the same time in our own cycle now where Serapis Bey and the others were at during the fall of Atlantis. We are ending a 104,000 year cycle. We are starting back over again. What Serapis Bey, Thoth and others did back then is a lesson for us, because we don't want to hang on to the old world that we are leaving behind. We might waste a lot of time trying to recreate what we had instead of learning about the new energy. Trying to hold on will not work, because the laws of nature will change with the shift of the age. So now the Guardians of this site, and Masters and Archangels working with us are going to give us a new heart and hopefully they will give us new eyes to see, and new minds to learn as well. Who knows how this is going to play out. But today we know for sure that they gave us a new heart, a personal holy of holies, so we can re-build from this center point. Luxor temple could only be activated by a group on the same frequency. Here in this outer area there would be multiple people using many alter stones. They put their hands on these stones to activate the energy and then they could do anything with the energy. Anything that their minds focused on would manifest if their minds and hearts were in sync. They all had to be unified. Of course, the "bad guys" got ahold of this somehow, like they are trying to do again in this cycle. But they are not going to survive their attempts as the failsafe program has no back door for them to get in anymore. That was fixed 26,000 year ago. They are not going to be successful controlling us much longer, and we are already seeing a houses of cards tumbling down all around the world. Even last year, Egypt fell in just a few days. Anything that is out of alignment with the truth will fall away, and the only thing that will be left is the truth. So the trick is to not hold on to any of the old stuff that is falling away from us now. This is part of a divine plan that you agreed to or you would not be here at this time. We will not fail. "To read more about Thoth and the Emerald Tablets - com/emerald.html">http://www.crystalinks.com/emerald.html. *The Ascended Master Serapis Bey is the Chohan of the Fourth Ray, the white ray of purity. Serapis Bey emphasizes harmony and discipline. Disciples in his retreat are assigned to work on projects with others, teaching them the importance of serving together harmoniously, supporting one another. His many lifetimes exemplify his devotion to purity of motive. 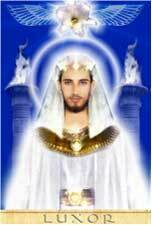 Serapis Bey served on Atlantis as a high priest. Before the sinking of Atlantis, he moved the ascension flame to Luxor, Egypt. 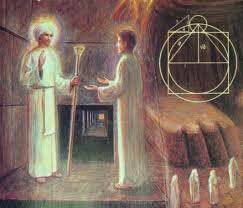 Serapis Bey and his disciples are fierce and immovable in their dedication to purity and to the disciplines required for the ascension. Amenhotep III-Serapis Bey as the Divine Architect is believed to have begun his rule at about the age of nine. It is likely that a relative acted as regent for him until he came of age. As an Egyptian Pharaoh, Amenhotep III, and his wife Tiye are known as the founders of monotheism in Egypt, a practice continued and expanded by one of Amenhotep's sons, Akhenaten, an incarnation of the Ascended Master Lanello. 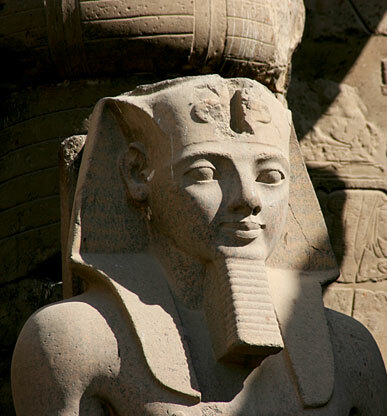 Amenhotep III's extensive building projects included the construction of the temples at Luxor on the Nile and a large number of other projects in Nubia. He also initiated comprehensive building projects at the Temple of Karnak. When Amenhotep III died, Egypt was a strong and powerful country with a great deal of influence in the international world. His son, Akhenaten, extended Amenhotep's reformation of the many-faceted Egyptian religion, emphasizing the worship of ONE God, represented by the SUN.